Wi-Fi Overload – Sounds Familiar? Wi-Fi is meant for homes and other small spaces with more modest Internet demands, says Ernie Mariette, founder of Mariette Systems, which installs conference Wi-Fi. "You´re asking a technology to operate beyond its capability." Conference organizers and the Wi-Fi specialists they hire often fail to provide enough bandwidth. Many depend on the infrastructure that the hotels or convention centers hosting their events already have in place. Let’s see how it works at Lotusphere in January. Perhaps there need to be some areas during the OGS with network cables to plug in to, to complement the Wi-Fi network?. You’d better get used to this kind of thing because we’ll be seeing a lot more of it in the future. All any of us can do is pray we’re not a victim. [T]he whole affair will feel like a stomach punch for anybody considering cloud adoption in the coming year–especially those considering Office 365, Microsoft’s major cloud offering that ties into its Office suite. Interesting explanation. I have only seen this solution in a couple of places, mainly Best Buy and Fry´s (both electronics stores). I just got everything finalized for Lotusphere 2011. I managed to find a $155 roundtrip fare on AirTran from Dallas to Orlando, and I got a room booked at Dolphin. IdoCheckin is back for the 3rd year, and as some of you in the community already may have noticed, I have been adding people on FourSquare and Google Latitude (where I am texasswede@gmail.com) during the last few days. Add me if you like. I will try to check in frequently during Lotusphere if anyone want to meet up. So what’s left to do? Well, the most important thing: planning! The first thing I did was to download Ben Langhinrichs‘ Lotusphere Session Database. You haven’t downloaded it yet? Then go do it. I also went and ranked some of the sessions here. 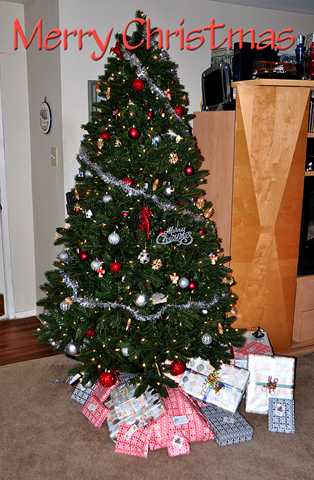 This year I will focus on Xpages. As I mentioned previously, we are just now finished upgrading our users from Notes 5 to Notes 7. Most of them still got the Notes 5 mail template, though. But the IT Operations Manager have mentioned that he plan to get us on 8.5.2 soon. I am hoping for sometime before next summer. So I can see a possible use for Xpages at my current workplace, especially after the issues Sean Cull wrote about have been addressed. There are a number of interesting sessions about Xpages, but I will also attend some sessions about user interface design (something I am very interested in) and of course harass the poor developers in the labs. I am of course also excited about seeing so many of the people I consider friends, even if I know that several long-time Lotusphere visitors will not be there. I will be flying in Saturday morning, so I can attend BALD (Bloggers Annual Lotusphere Dinner) that afternoon at Big River Brewhouse. Of course you do not need to be a blogger to attend. That’s the beauty of the Lotus community, everyone is welcome. If this is your first Lotusphere, don’t miss Andy’s Guide to Lotusphere. I am late to the party, but I also want to congratulate Lotus Notes on it´s 21st birthday on December 7. This is a product that is extremely powerful, simple to use and has a great community where I can always reach out for (and receive) help. The other evening I was watching an episode of Top Gear (the UK version), where they tested three luxury sports salons. One of the cars tested was the Maserati Quattroporte. My best friend, who lives in London, happens to own one, and I got to ride in it this summer when my son and I visited my friend. So of course I was excited to see what the Top Gear verdict would be. Knowing my friend, I was sure he had selected the best car. And of course Top Gear came to the same conclusion. someone tries to take it away from you, you will kill them. That is how I feel about Notes. As with most products, there are annoying things with it, but we all love the product and would not want anything else. So happy birthday, Lotus Notes! This is a guest blog entry by Tanya Delaney. Recently, I had the honor of meeting and working with Karl-Henry Martinsson. I am a Lotus Notes ?ewbie,´ though I have a technical and web-based background. The last time I used Notes was as an end user (limited to checking email) while an employee of IBM in 1993. When Karl introduced himself as a Lotus Notes programmer and developer, I said to him, "People still use Lotus Notes?" The rest, as they say, is history; Karl has been on a mission to educate me ever since. I am a web designer and developer, most fluent in ActionScript as well as the web standards HTML, CSS, some PHP, and I dabble in a bit of whatever is needed depending on my clients´ particular situations. As far as databases go, I always use MySQL. For this reason, Karl has been singing the praises of Lotus Notes and Domino ?though his accolades have fallen on my deaf ears. I was under the [incorrect] impression that Lotus Notes was only good for email, much in the way MS Outlook is, and I had no use for either. Karl gave me a crash course in Lotus Notes as well as LotusScript to show me how efficient Lotus could be. As an example, he created a simple database in mere moments to hold ?ecipe´ data as well as titles, authors, and even country of origin information. He not only put it together (and made it look nice), but also challenged me to write a similar web ready database in as much time. “…”Right. I already knew matching both the power of Notes as well as his programming skill was impossible. So Karl amended his challenge: in ten times the amount of time, write a similar web page utilizing a database with all the same information. What took Karl 5 minutes, I now had 50 minutes to create? I knew how to solve the problem. I could recreate Karl´s steps in my own native tools, but pulling it off without Lotus Notes was going to be a feat. Even without knowing much about Lotus Notes, I knew I was bested. However, I had a MySQL database at my disposal and a bet to try to win. Here is a screen shot of a basic, simple form created for this challenge. Since I decided to interact with a MySQL database, I decided to use PHP to interact with it. This form calls for a PHP file called process.php (in line 1), a file I had to create. The rest is pretty simple ?the form calls for different fields and once the user clicks on submit, all their values will be passed to the SQL database. The above script is basically listing all the values that our database has for this particular challenge, as well as login information to the database. After authentication, all the values are passed to the database. However, part of the challenge was to also retrieve this information, so, yet another PHP file needed to be created. //display the fields "country, author, recipename, type, lc" of each record. The script above queries the database and will keep looping until it receives all the data. It will be displayed on a website in plain text. This, however, is only 1 view of the information. Lotus Notes definitely wins here ?I ran out of time before I could even begin to attempt different views. Even if I had more time, it would take a bit of scripting to change the order of data ?something Lotus Notes does very well. Thank you, Karl, for giving me such an eye opener about the power of Lotus Notes and Domino. You´ve definitely made a believer out of me. It was truly an eye-opener to sit down with a Lotus master and observe the simplicity and power of a stellar product that Lotus Notes is. Now I will describe what I did in Notes. The recipe types (appetizer, main course, desert and other) are hard-coded, but could of course be pulled from a profile document or be built some other way. I also added field hints, so the user can tell what to enter in the different fields. 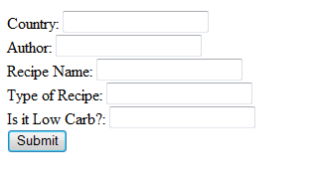 I then created a view, with the view selection SELECT Form="Recipe". 1 : Categorized, displaying the value of the field ?ype´. That´s all. A total of five lines of code, put together in about 5-6 minutes. Note: I used my generic Notes Application template for this, so that saved me a minute or two and gave me a nice look, but the total design time when I showed Tanya this the first time, without that template, was about 5-6 minutes, including actually explaining everything I did. In the original challenge I alsecreated two copies of the view, categorized/sorted on different fields (‘by Origin’ and ‘by Author’) to show the power of views. Tom Duff wrote about Domino as an application platform, and in some of the comments there was a discussion about making the Domino server free as a web platform, at least for smaller companies. Go and read the comments. [W]hy pay for a Domino server for only applications when you can do stuff in open source platforms like Plone, Alfresco, Joomla, Drupal, CMS2, etc. that are completely free? The only way that the slide would stop is for IBM to recognize what it has and market Domino heavily as a Web server. In addition, they need to price the server accordingly compare to the open source solutions out there. I actually have a solution already built on Domino and will be offering the same solution as SaaS. Sadly the Domino licensing model does not support our business model. So although I want to use Domino, Domino can do the job, does it well, the pricing rules it out. It is cheaper for me to have the application rewritten on a different platform than to buy the Domino licenses. The last comment, by Carl Tyler, is actually a response to me (comment #26). I was recently approached about developing a web application (online product catalog, simple shopping cart, then a CRM system to handle the processing of orders between several separate geographic locations) which I could put together in Domino in a fairly short time. A very good friend was thinking about using MySQL, Joomla and Magento to build the application, but that is a lot of downloads and installs. Why not use Domino, especially when I can build the application in very short time? Well, mainly because the customer would not pay thousands of dollars for the Domino server license. Domino Collaboration Express can not be used for web applications by unauthenticated users, if I understand the licensing correctly. So no public web server allowed. I would have to get Domino Utility Server Express, which requires PVU licensing. Even with a single core, single non-Intel processor we are talking over $1000, and quite a bit more if going to say a dual core single CPU Windows server. 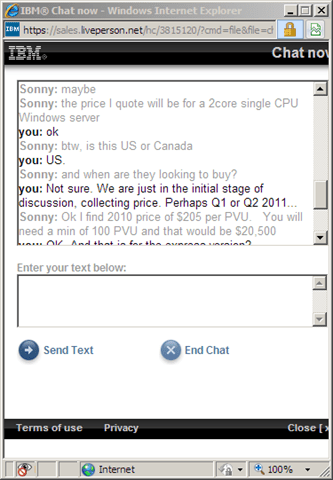 According to "Sonny" at IBM (see chat to the right), that option would use 100 PVUs at $205/PVU, for a total cost of $20,500.00! That’s insane! So could IBM not provide Domino as a free web application platform? At least some restricted version, or as someone called it "community version". Let’s say unlimited anonymous access and 100 (250?) authenticated web users, but no mail, just applications. Any Notes users or mail users still need a Lotus Notes Collaboration Express client license. Promote Domino as the great web application platform it is, a RAD platform with strong security, built in database and much more. This would have the effect that more people would start using it. Isn’t that why Domino Designer was released for free, to promote Notes/Domino development and spread it to new developers? The next logical step is to provide a server. Now we have developers who learn the platform and see what you can do with it. They will push that to their clients or the companies where they work. This will get Domino in the door, even without email. The next step is obviously that the company realize what can be done if they get the Notes client and start using email. They buy a few Notes Collaboration Express licenses and start testing, and soon they might get Notes for everyone. Nobody will buy a product they never heard about, or one they heard about but never seen. By getting Domino out there, making the product visible, more companies and corporations would learn about it. In the long run, I think that would lead to more sales to small and medium sized businesses. Have you been looking for help to get a pilot up and running using Lotus Symphony in your organization? We now have a fee based services offering from our IBM Lotus Lab Services organization that can help you do just that. The IBM Lotus Symphony 3 QuickStart solution gives you everything you need to evaluate the ROI and feasibility of deploying Symphony in your organization. We provide hands on Symphony training, video training with the Symphony Multimedia Library, best practices for user segmentation, analysis of Lotus Symphony features and benefits, and proven deployment strategies. I think a free Domino Web Application Server would be a great way to increase the interest for Domino, and show what it can do. I will in the next day or two have a guest blogger write about her impressions of Lotus Notes and Domino. She is totally floored at what Domino can do and how easy many things are. But all that count for nothing if the server is so expensive that nobody outside big corporations can afford to develop web applications for the platform. Update: "Sonny" at IBM just mailed me, he found the Domino Utility Server Expresspricing, the quote he gave me initially was not for the Express licensing. The per-PVU cost went down to$27.25 for a total cost of $2,725.00. Still expensive compared with the alternatives, though. Free (restricted) Domino web application server – vote at IdeaJam! As Peter von St? ?l suggested in a comment to my previous post, I have now added a suggestion at IdeaJam. Please go and vote. Don’t forget to add your comments, especially if you are against it, please motivate. I am curious to hear opposing arguments. Update: I have been having some issuesembedding the IdeaJamcode, so please use this link.